Do yak die at low altitude? When I visited Tibet, I was told that they did, and that the yak you see in zoos are all cross-breeds. Yak genetics have adapted to the high altitude, they said. You can’t take them down, they said. It sounded plausible, and I thought it was a neat fact to include in a post here. I just needed a reference. But when I searched, I didn’t find any convincing evidence that yak can’t survive low altitudes. In fact, the more I searched, the less I knew what a yak even was. I found info about wild yaks and domesticated yaks, and some notes about cross-breeds. Among the muddled facts, I found two things that everyone seems to agree on: Bos grunniens is a domesticated yak, and it exists in low altitude zoos far away from Tibet. 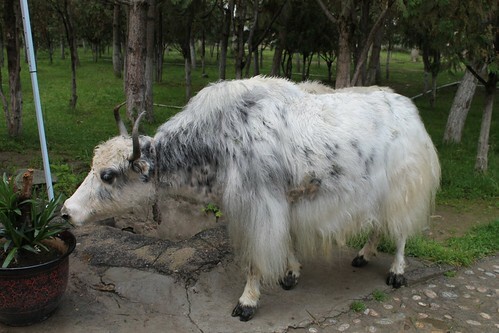 Domestic yak walking out of a Tibetan zoo and nibbling on a plant. What about wild yaks? When they were first classified, they were called bos mutus, and that name is still in use, but it’s thought to be a subspecies of bos grunniens, not its own species. The wild ones are much bigger than domesticated yaks, and more elusive. The genome of bos grunniens has been sequenced. This came from domestic yaks, because there are a lot of those and the wild version is threatened. So everything we know about yak genomics comes from the tame kind – the kind that definitely can survive in low altitude zoos. 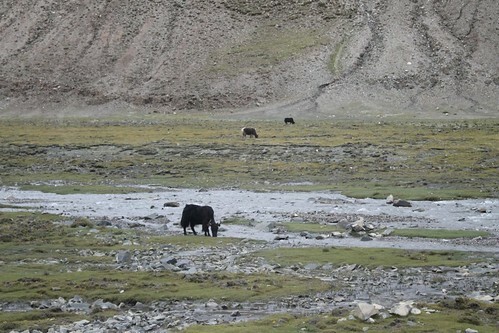 Genomic analysis found that yak are indeed genetically optimized for high altitudes. 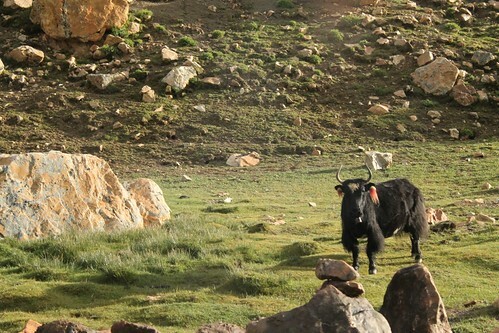 Domestic yak might be optimized for high altitudes, but they have been taken to lower ground and they lived. The same might be true for wild yak, but there are few of them and they’re hard to find. A few months ago, a large herd of them was discovered in a remote area of Tibet. Good news, because it means that they’re less threatened than we thought, but they’re still a bit of a mystery. So do yak die when you take them out of Tibet? Oh, sure, they’re unhappy and might die, but it’s not the lack of altitude that kills them. It’s probably the heat. Yak are also optimized for a very cold climate. When I was in the Himalayas two years ago, it snowed in August. This is the kind of climate yak are used to. If you take them off the plateau, they can learn to adapt to the excess oxygen, but the excess warmth is much harder. To make the yak more versatile, it’s also crossed with regular cattle, or bos taurus. The resulting animal, a dzo, is the best of both worlds: it’s strong like a yak, but it thrives in a climate that isn’t quite as harsh. It doesn’t have the characteristic woolly coat. 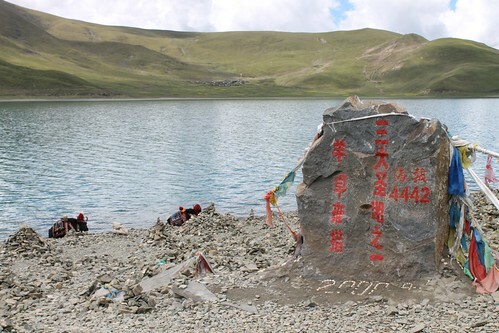 The remoteness of Tibet is definitely brought home by the difficulty I’m having finding any sort of consistent information on its most famous animal. I had a much easier time researching platypus! This entry was posted in Have Science Will Travel and tagged tibet, yak. Bookmark the permalink. Many thanks for sharing, I would like to post it on my Twitter to share with my friends? You can always share the link to any post at The Finch & Pea via social media. Unless otherwise noted, all our posts are released under a Creative Commons Attribution-NonCommercial-ShareAlike license which makes them very easy to share.